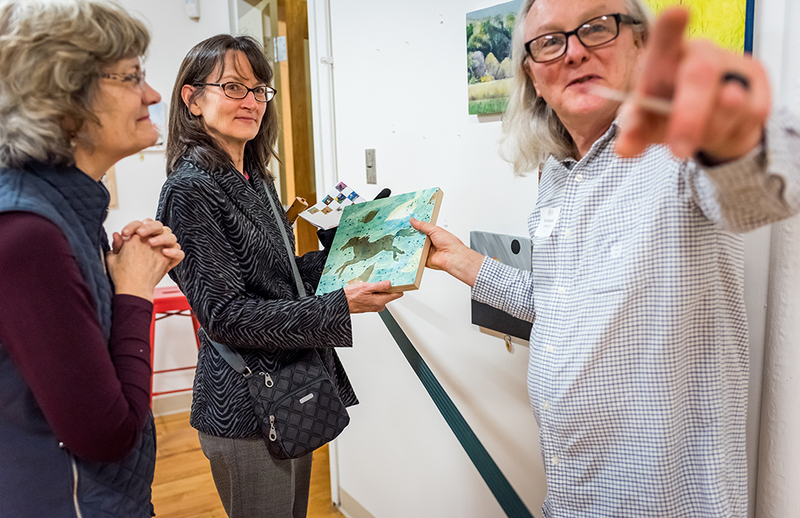 Little treasures were too many to count at the closing party for AVA Gallery’s 2nd Annual 10×10 Exhibition and Fundraiser. In every corner, it seemed, there was something going on: food trucks, a photo booth, a live DJ, and dancing. And that’s all before you got to where the art was happening. 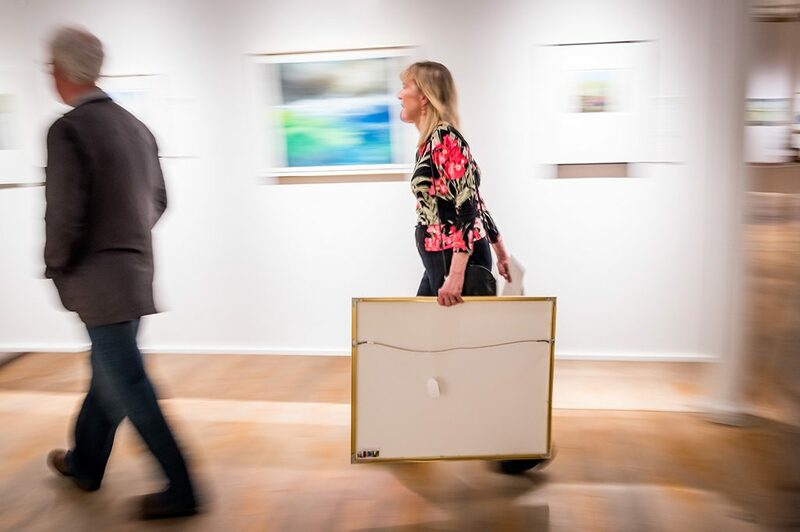 The event’s namesake showcase of art of was its own endless array of treasure. 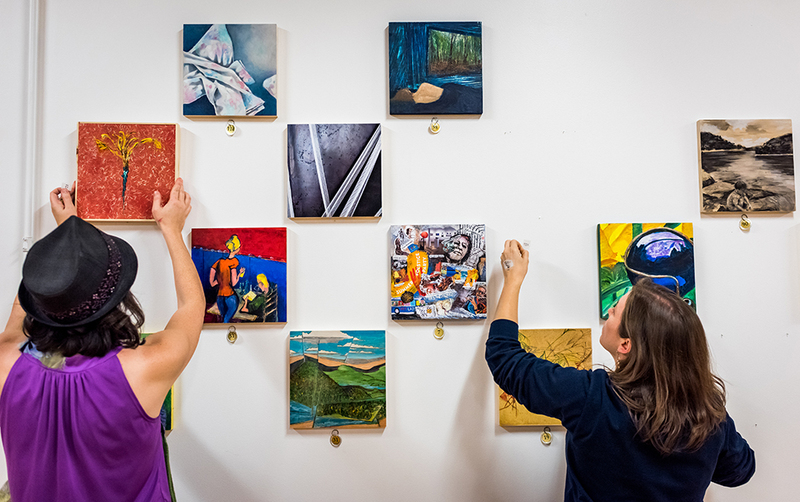 More than 140 works—all made using the same 10-inch by 10-inch wooden panel—created and contributed by 103 area artists covered the walls of the Members’ Gallery. 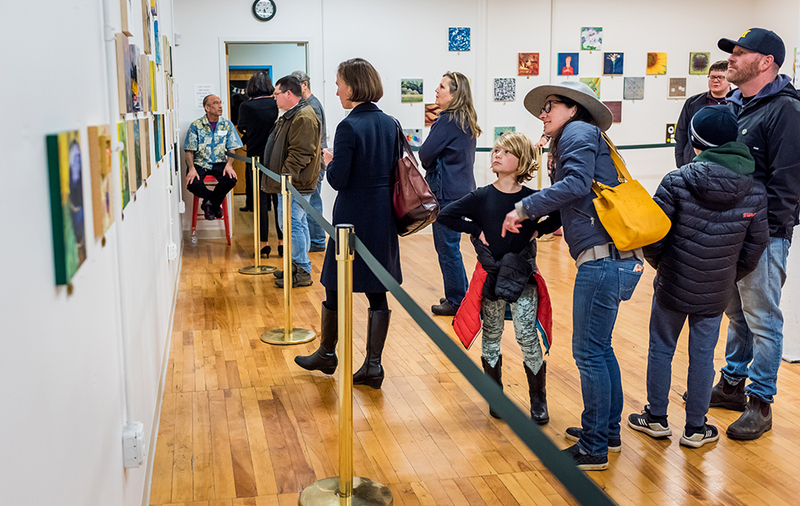 On Friday, after two weeks on display at AVA, the art works were finally available for purchase at $100 a piece. 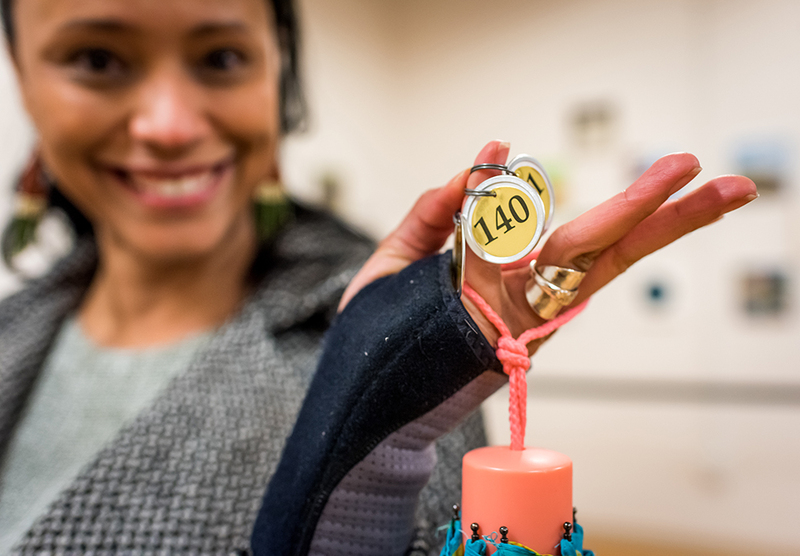 Partygoers and potential buyers might have looked like kids in a candy store—and some actually were kids—as they moved from panel to panel, admiring each one for its own colorful, often whimsical, and bite-sized take on the challenge to create something inside less than one square foot. 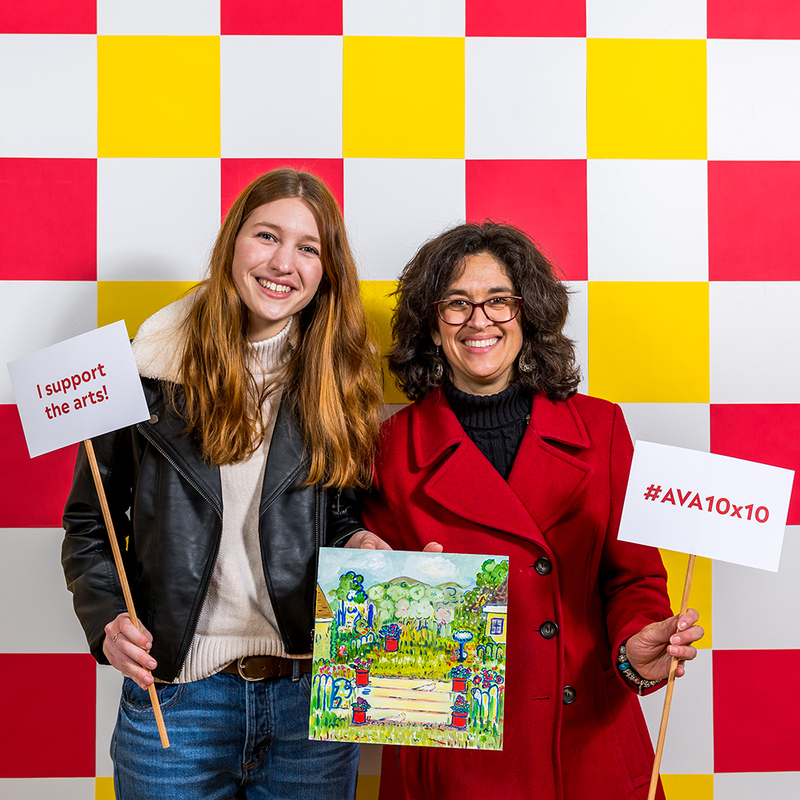 Mila Pinigin, AVA’s Exhibition Manager and organizer of the event, was truly impressed with the talent and range on display in the 10×10 exhibit, featuring works by professional artists and community members alike, although they were shown anonymously, encouraging partygoers to see each piece for its own sake. 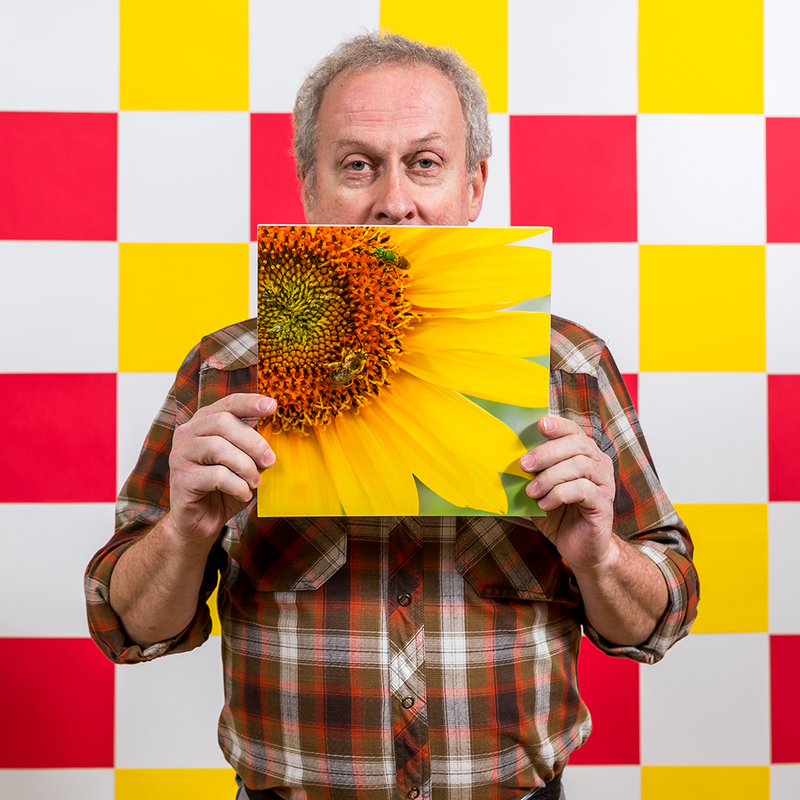 Pinigin learned that some artists used the 10×10 opportunity to rekindle old techniques, such as oil painting, or to experiment with new. 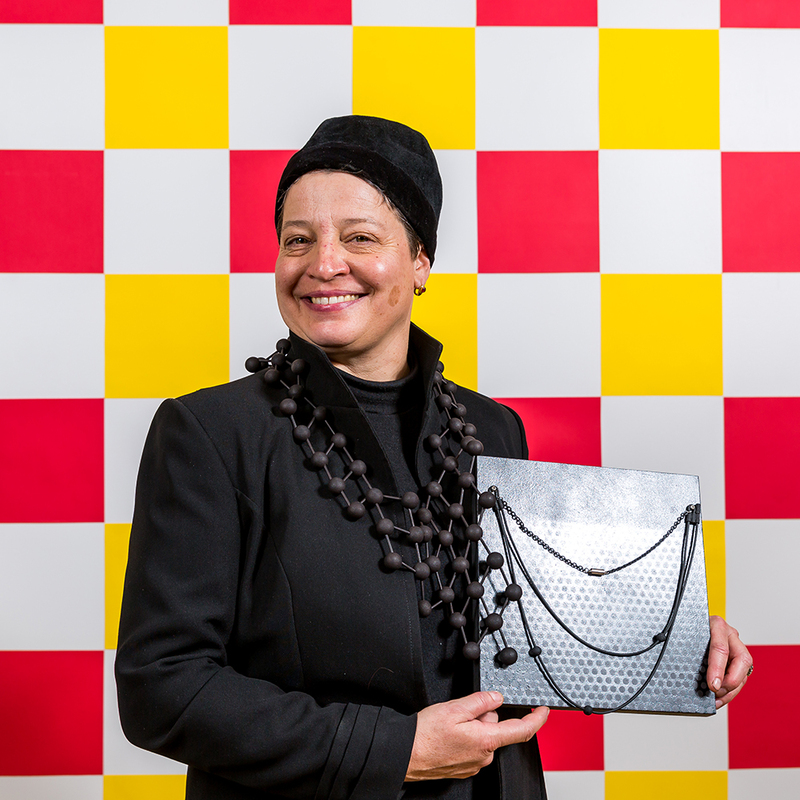 “One artist wanted to buy his own piece back because it’s taken him on a whole new trajectory,” she said. 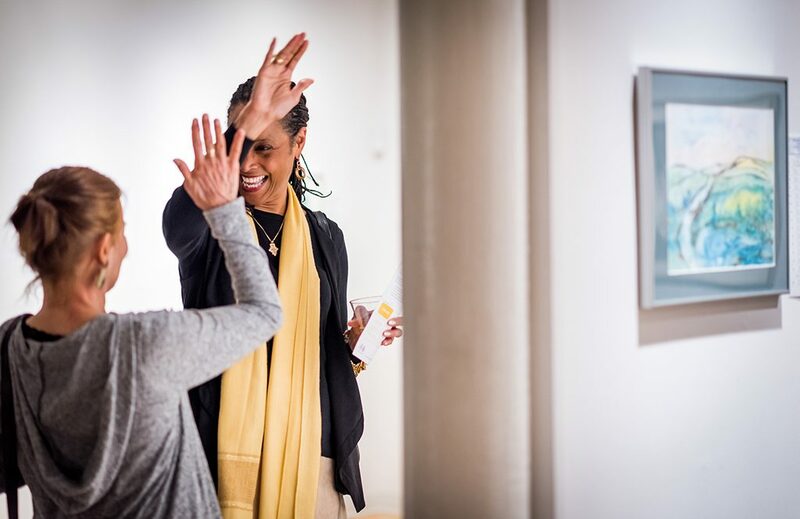 And you could call the general mood in the gallery gleeful, with so many people either itching to snag the little piece of art they’d had their eye on for days or completely unable to decide which one they liked most. 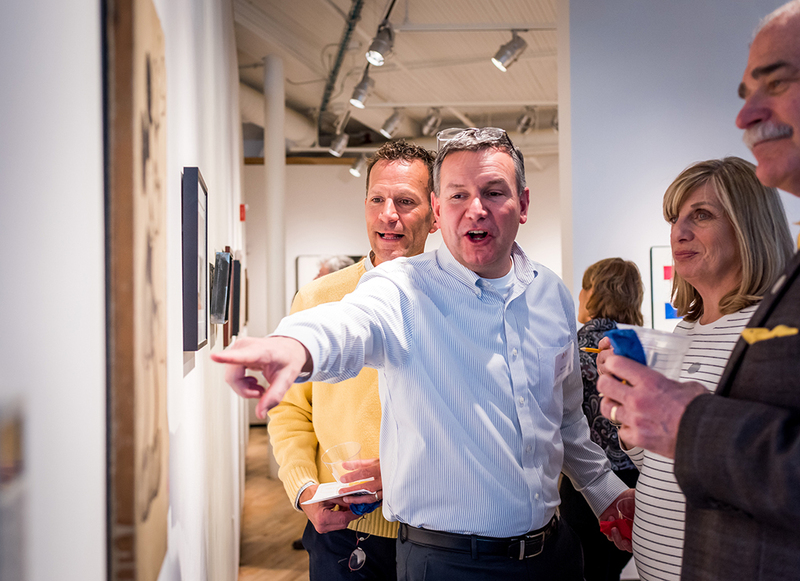 Some were purchasing art for the first time. Some, of course, went home with more than one. 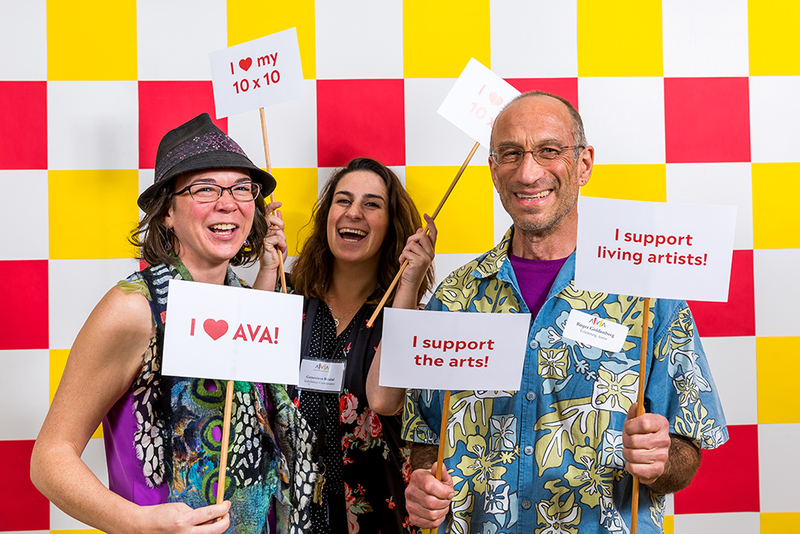 Inside the lobby, a pop-up portrait studio gave buyers the chance to pose with their exciting new purchase—a token of gratitude for their support of AVA’s mission to make art happen in the community, through classes and workshops, exhibitions and scholarships, for people of all ages and abilities. The fervor of the occasion held steady, even as panel after 10×10 panel came down from the wall, heading for its new home. Delicious flavors from the VT Munchies and Taco’s Tacos food trucks outside mingled with DJ Melissa’s thumping rhythms well into the evening, and it wouldn’t have been odd to catch someone dancing their way out of AVA, with a piece of art tucked beneath their arm. Little treasures can still be found in our Members’ Gallery–each for only $100! 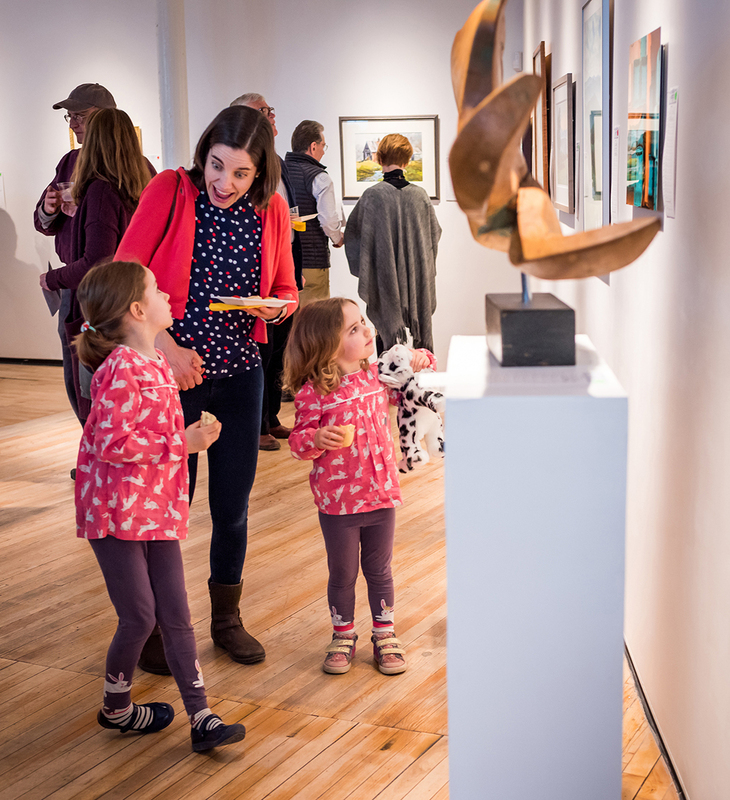 Last Friday evening, AVA’s main gallery space quickly filled up with people of all ages. Some arrived by the yellow school bus-full. All came to celebrate the artists whose work was selected for the 10th Annual Best of the Upper Valley High School Exhibition. 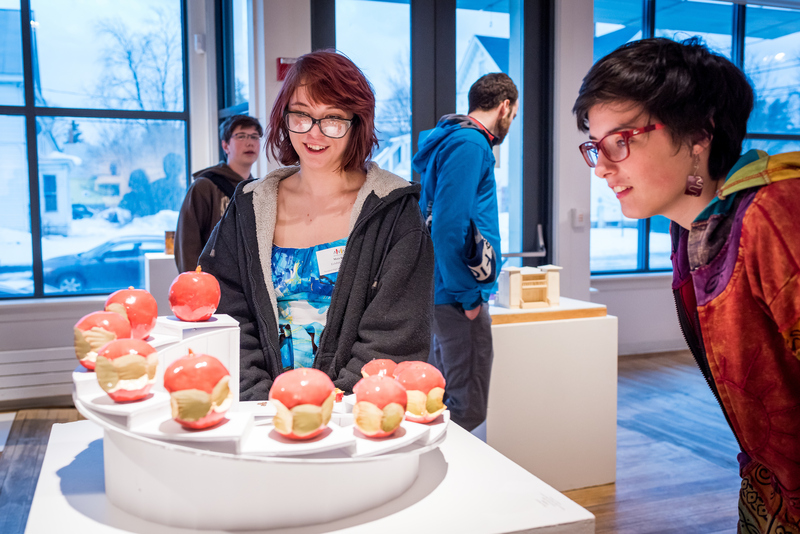 Featuring 140 works of art from 139 artists representing 16 different high schools in the Upper Valley, the exhibition is an impressive showcase of the breadth and depth of creative young talent in our region. 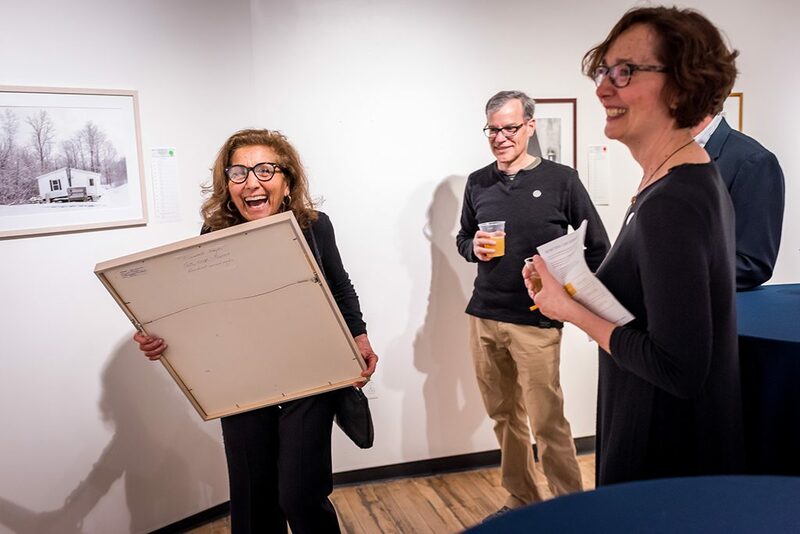 The gallery on Friday was tinged with anticipation as the artists, their families, and friends awaited the awards ceremony, announcing the winners and honorable mentions in each of 14 categories, from analog photography and painting to woodworking and wearable art.